It may have been just a temporary tattoo but the criticism of Emma Watson’s grammatical gaffe came thick and fast. The star had the tattoo on her arm when she was pictured on the red carpet at Sunday’s Vanity Fair Oscars party. 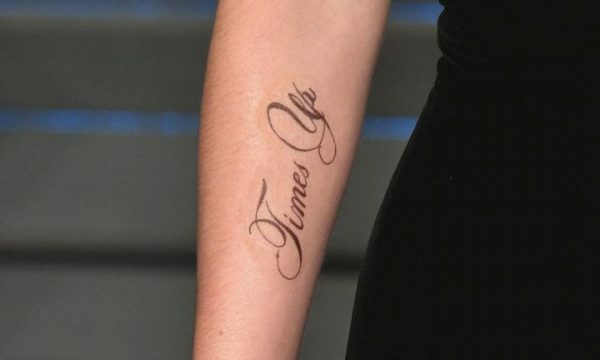 It read “Times Up” in support of the movement against sexual harassment. But it seems the tattooist (or, more likely, designer) left out one important factor: the apostrophe was missing between the E and S, making the phrase grammatically incorrect. Twitter was soon swamped with tweets about the erroneous tattoo. Last month Watson donated $1.39 million to a fund for victims of sexual harassment. She was also one of the first to speak out against producer Harvey Weinstein, who is facing numerous accusations of sexual harassment. She also recently backed an open letter signed by over 200 female stars calling for an end to sexual harassment across all industries. The Oscars itself was dominated by stars using the awards to speak about movements such as Me Too and Time’s Up.